MEMS market overview: IHS iSuppli | Pradeep's Point! Pradeep Chakraborty's Blog — A resource for semiconductors, solar PV, telecom, electronics, infocom, components, nanotech, IT and leisure! The MEMS Executive Congress, MEMS Industry Group’s annual executive conference, was held on Nov. 2-3, 2011, in Monterey, USA. Here are the excerpts from a presentation on the MEMS market overview by Jérémie Bouchaud, director and principal analyst, MEMS & Sensors, IHS iSuppli. Thanks are also due to Maria Vetrano for providing me with this opportunity. Source iSuppli MEMS Market Tracker – Q2 2011. 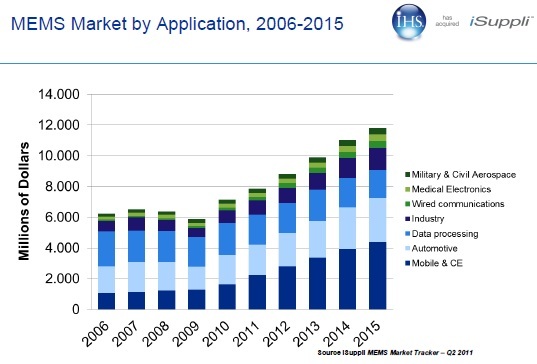 The market for MEMS has been growing, and is slated to grow at a CAGR of +10.5 percent from 2010-2015. Consumer and mobile MEMS market is slated to grow 22 percent CAGR from $1.5 billion in 2010 to $4.4 billion in 2015. Smart phones remain the locomotive. MEMS content has increased in smart phones. The Accelero has migrated to feature phones. There will be limited opportunity in the gray handset market. Tablets are providing an additional market boost. There will likely be 275 million media tablets in 2015. The ‘full PC tablets’ in consumer laptops segment will also be impacted positively. Dangerous games — they peaked in 2010, will be down in 2011-2012, and go up again in 2014. New MEMS devices in 2011 include MEMS thermopiles in handsets (TI), MEMS joysticks (Knowles) and RF MEMS switch/varactors. There will be new opportunities in sport/reha. However, IHS iSuppli not too excited about motion sensors for remote controllers and MEMS speaker — there will be no revenue by 2015. Hottest of the hottest include motion sensors in handsets and tablets. There are likely to be a few more fat years’ for consumer MEMS. The fat years include the period from 2010-2013, which translates into robust smart phones sales and skyrocketing media tablets shipment. The automotive MEMS market will grow at 8.5 percent CAGR from $1.90 billion in 2010 to $2.86 billion in 2015. Safety applications dominate, often with mandates. Examples are: ESC with (MEMS gyro, accelerometer, pressure sensors), airbags (accelerometer, pressure, ultrasound), and TPMS mandate in US since 2007, EU from 2012 and now China (from 2015). Japan caused 2.2 million production drop globally, in 2011. Car production forecast has also been revised down in for 2012. China is driving sensor sales, e.g., basic MAP to lower emissions. Combo sensors are accelerating price erosion (7-8 percent, instead of 4 percent). Newcomers are finally breaking into safety sensor markets. Some examples are SensorDynamics for gyro, MEMSIC accelerometer in airbag-based ESC systems from Autoliv. Also, ST and Epson are gunning for safety applications. Finally, high value MEMS markets will grow at 12.3 percent CAGR from $1.5 billion in 2010 to $2.7 billion in 2015. Global trends are benefiting high value markets. For instance, energy and global warming is witnessing MEMS reducing energy consumption (in industrial processes, residential heating and billing systems, in transportation systems). Also, MEMS are finding energy (geophones for oil/gas exploration, measurement-while-drilling). MEMS is also handling the aging population, obesity issues, etc. MEMS for less invasive monitoring of patients and elderly people.Also, it is more affordable and provides continuous diagnostics. MEMS increase efficiency and comfort of drug delivery. The rise of China and other BRIC countries is another trend. China has already turned into a major consumer of MEMS for industry, infrastructures, aerospace and defense as well wired communications. Fiber deployments in China is, for example, boosted by new government stimulus and largely pulls the global optical MEMS market for telecom. Pradeep, thanks for the summary! Did you attend this event, live or virtually? * Pradeep's Point - Winner, World's Best Blog in Electronic Hardware -- Electronics Weekly, UK (December 2008). * Pradeep's Point - Honorable Mention for Best Technology Blog, Blognet Awards 2009 (February 2009). * Green Gadget of Texas, USA, awarded Pradeep's Point as the "Featured Tech Site" for 2011! * Gorkana, UK, awarded Pradeep's Point as the Blog Influencer 2012. * Pradeep's Point won an award from Elite Techno, USA, April 2015. * Pradeep's Point - Best Blog by Online Geeks, USA, April 2016. Pradeep’s Point – Best Tech Blog, IndyWood Media Excellence Awards, Hyderabad, India, Sept. 2016. * PC's Semicon Blog was awarded the Top Digital Media Blog by Online IT Degree (November 2010). * PC's Electronic Components Blog was awarded Top Resource for Electrical Engineers by ElectricalEngineeringSchools.org, USA, July 2013. * PC's Electronic Components Blog ranked among “The 101 Best Resources for Electrical Engineers,” by Pannam Imaging, USA August 2014. * PC's Electronic Components Blog selected as featured blog by InsideTechKnow, USA, Feb. 2015. * PC's Electronic Components Blog selected as featured blog by Online Geeks, USA, April 2016. * PC's Electronics Blog selected as Featured Site of the Day - XploreEngineering.org, USA. Pradeep Chakraborty's Blog was selected as the best in the world in the Electronic Hardware category for 2008-10, by Electronics Weekly, UK. World’s Leading Blog Influencer 2012! DVCon India 2014 aims to bring Indian design, verification and ESL community closer! Apple continues to ‘wow’ all over again! इधर भी गधे है, उधर भी गधे है, जिधर देखता हूँ गधे ही गधे है! गधे हस रहे है, आदमी रो रहा है, हिंदुस्तान में ये क्या हो रहा है! ;) -- Kavi Om Prakash Aditya!